A self-cleaning soldering flux used for capillary joints on copper pipework, brass and mild steel. This product is UK WRAS listed for both hot and cold water including potable water. Being ph neutral at room temperature, it is also suitable for gas pipework. 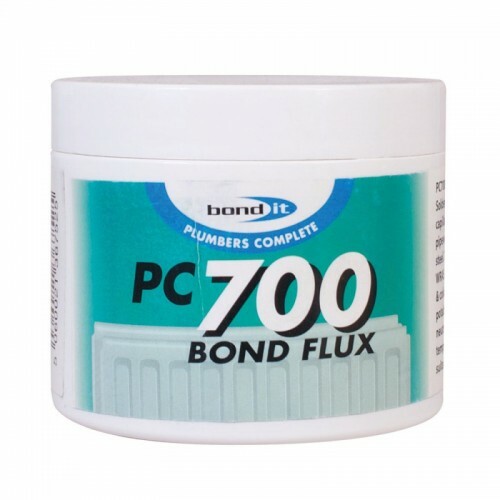 PC700 Bondflux is used for capillary joints on copper, brass and mild steel. Apply a small amount of Bondflux by brush. Apply to pipe and assemble joint. Apply heat and solder in conventional manner. Once set wipe the joint with a dampened cloth to remove residue and flush inside of water piping. If installing a heating system flush system with PC300 Uniclean once installation is completed.